"Cliff Point and Hungry Harbor, Washington"
Click image to enlarge Hungry Harbor and Megler Point, as seen from Cliff Point. Image taken April 9, 2004. 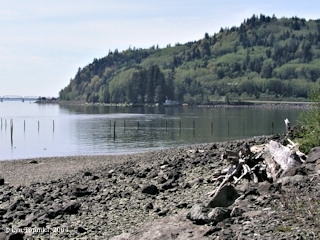 Cliff Point is located at Columbia River Mile (RM) ____, and is at the upstream end of Hungry Harbor. Hungry Harbor is a small cove located at Columbia River Mile (RM) _____, upstream of Megler Point and downstream of Cliff Point. Hungry Harbor was the location of Lewis and Clark's camp of November 10th and 11th, 1805. 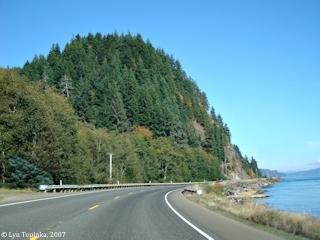 On the downstream side of Hungry Harbor and Megler Point is Megler Cove, the location of Lewis and Clark's "Dismal Nitch" camp of November 12th and 13th, 1805. Further downstream is Point Ellice, McGowan, Washington, and "Station Camp", where Lewis and Clark spent 10 days. 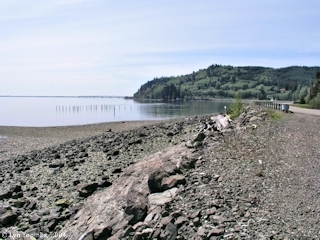 On the upstream side of Hungry Harbor and Cliff Point is located the "ghost town" of Knappton. Further upstream is Grays Point and Grays Bay. "Hungry Harbor -- Harbor on the Columbia River, 1/2 mile northeast of Megler, southwest Pacific County. The name derives from a legend, stating that 7 men drifted into this harbor in a disabled boat and starved to death. An alternative version of the name source is based on the habit of fishermen who found the harbor ideal for anchoring at mealtime." On the morning of November 10, 1805, Lewis and Clark left their camp at Portuguese Point (which they called "Cape Swell") and continued downstream 10 miles until high winds and waves turned them around. Backtracking for 2 miles, the men pulled into what is today known as "Hungry Harbor", at the mouth "of a small run". There they unloaded and waited for calmer waters. When the weather calmed a bit, the men set off once more and made it one mile downstream before high waves once again forced them to shore. For the next 2 nights (November 10 and 11) the men camped on the logs along the shoreline, occasionally being floated with high tide, and continually being pelted by rain and pounding waves. The slope behind them was becoming saturated and sliding down on them. 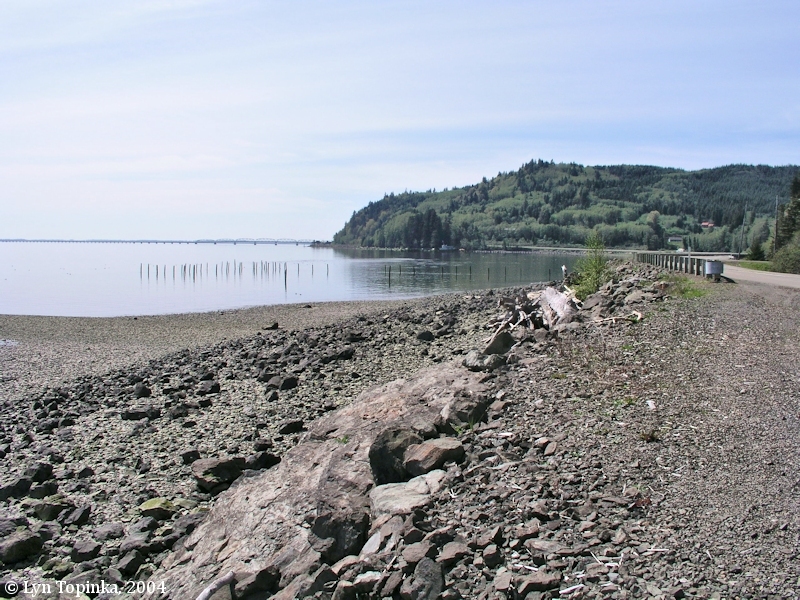 Finally on November 12, the men took advantage of low tide and moved 1/2 mile around Megler Point to "a small brook" now called "Megler Cove". Lewis and Clark would come to call this campsite "Dismal Nitch". Click image to enlarge Cliff Point, from the west. Image taken October 13, 2007. Click image to enlarge Hungry Harbor with Megler Point in the distance, as seen from Cliff Point. Image taken April 9, 2004.